Beijing, China’s vehicle fleet currently totals about 5.4 million, ranking it first in motorization of any Chinese city. On November 28, Beijing’s municipal government announced it will further constrict its vehicle quota control starting in 2014, but vehicle ownership restriction alone isn’t enough to mitigate the city’s severe air pollution and traffic congestion. Photo by Malingering/Flickr. Beijing has launched an effort to tighten up its vehicle quota control regulation and further curb air pollution and traffic congestion in China’s capital city. Echoing the city’s recent “Clean Air Action Plan (2013-2017),” an amendment to the car ownership restriction regulation was issued on November 28, aiming to cut the annual vehicle increases from 240,000 to 150,000, beginning in 2014. With this policy in place, the total vehicle ownership in Beijing will be capped at fewer than 6 million by 2017. However, the new measure only delays future air pollution and congestion that will arise from an ever growing vehicle fleet. 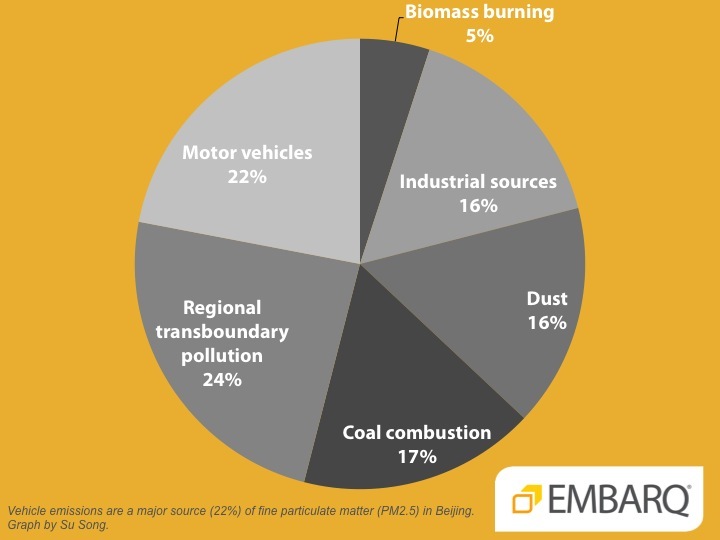 In order to mitigate this trend and truly restore clear days to Beijing, complementary measures are necessary to rein in car usage of the existing vehicle stock, such as congestion charging, and improvements in public and non-motorized transport infrastructure. Vehicle ownership restriction is not new to Beijing, however, there’s a vital need to further restrict vehicle ownership and usage – and to effectively do so will require more than just decreasing annual quotas on car ownership. Beijing began capping vehicle ownership growth in 2011, after which the annual growth rate decreased from 20% in 2010 to the current 4%. Unfortunately, the city’s car ownership was already so large that the lottery scheme came too late to effectively battle its severe air pollution and traffic congestion. 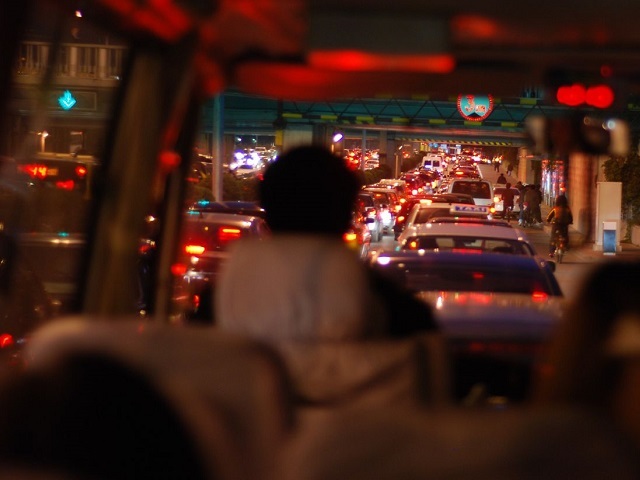 Traffic congestion poses the greatest health threats to drivers. In a congested area, insufficient fuel combustion from idling and cold starts leads to increased PM2.5 emissions. For example, on Beijing’s west 2nd ring road, the PM2.5 level reads 25-30 micrograms per cubic meter in free flow as compared to 90-100 micrograms in congestion. Drivers’ exposure is compounded by increased travel time due to congestion. Beijing’s current average vehicle speed in peak hours is 20-25 kilometers per hour, but according to the Beijing Municipal Commission of Transport (BMTC) is expected to sink lower than 15 kilometers per hour by 2015 if business continues as usual. Graph by Su Song/EMBARQ China. Fewer quotas for lottery, but more chances for earlier applicants. The improved “cap-and-lottery” system will provide earlier applicants – candidates who applied one or two years ago but failed to win a license plate – a greater chance this time around than late comers. As a short-term solution, the tightened vehicle quota system buys time for other medium or long-term alternatives to set in, including improvements to public transport, travel demand management (TDM) policies, and urban planning interventions. But car ownership restriction is not without controversies. The lottery system raises significant questions over equity, citizen’s rights, and risks stifling car manufacturing – an important economy driver. Beijing’s local auto industry will face losses due to restricted car sales, and may not receive compensation from the government.